Vålerenga IF today confirmed the signing of 24-year-old Danish midfielder Julie Trustrup Jensen on an 18-month contract, effective immediately. Trustrup wears the #6 shirt and joins fellow-Dane Stine Pedersen at the Club. Trustrup first joined Brøndby in 2009 as a 15-year-old, before quickly progressing into the senior squad for the 2010/11 season, where her performances saw her named the Danish Female Talent of the Year in 2011. Predominantly used as a holding midfielder for Club and country, Julie has also been played in a more advanced role earlier in her career. 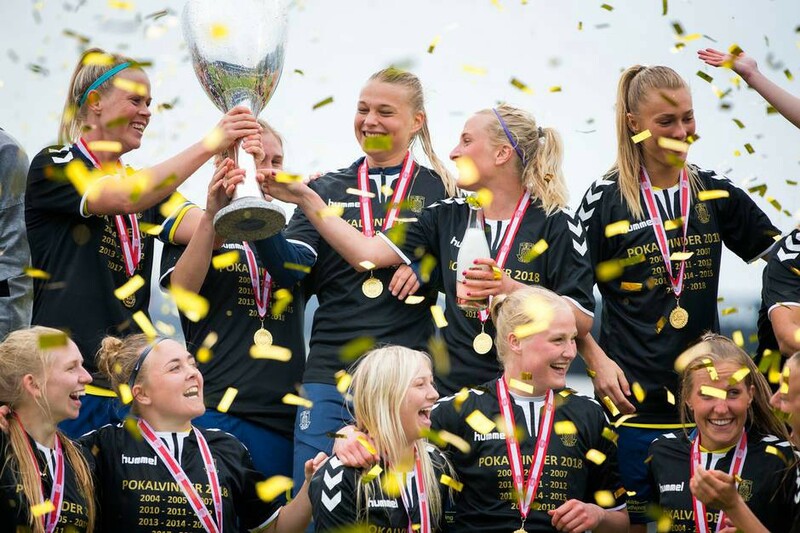 During her nine years at Brøndby, the Club won four league titles, seven Danish Pokal titles and reached the semi-finals of the Champion’s League in 2015. For the past three years, Julie has been combining football with a Bachelor’s degree in Sports Exercise Science from the University of Copenhagen. Trustrup has represented Denmark at every age group and has 21 senior caps, including playing a key role in Denmark’s qualification for the 2017 Euro Championships. Unfortunately, the week following qualification, in December 2016, Trustrup suffered an ACL injury which led her to miss the tournament. After returning to action in February 2018, the midfielder earned an international recall from new WNT manager Lars Søndergaard in June 2018 for the match vs. Ukraine, before withdrawing with a concussion injury. Vålerenga provides a new challenge and will see Trustrup join up in the midfield with Dutch captain Sherida Spitse, as well as Norwegian international Isabell Herlovsen and Ingrid Schjelderup. The Club moved into their new Intility Arena in September 2017, and have a clearly-stated ambition to be Norway’s leading female Club by 2020. They are coached by Olympic gold-medallist Monica Knudsen, who previously led LSK to four league titles between 2012-16. Julie Trustrup Jensen: “I’m so excited to join an ambitious club like Vålerenga. Norway’s league has a strong reputation and I look forward to being part of a full-time environment that will allow me to continue developing myself as a player. “After nine years at Brøndby, it’s time for me to try something new and I’m excited about moving city. I received a warm welcome from everyone when I visited and it gave me confidence this is the Club for me. Notes to picture editors: Additional pictures are available on request.